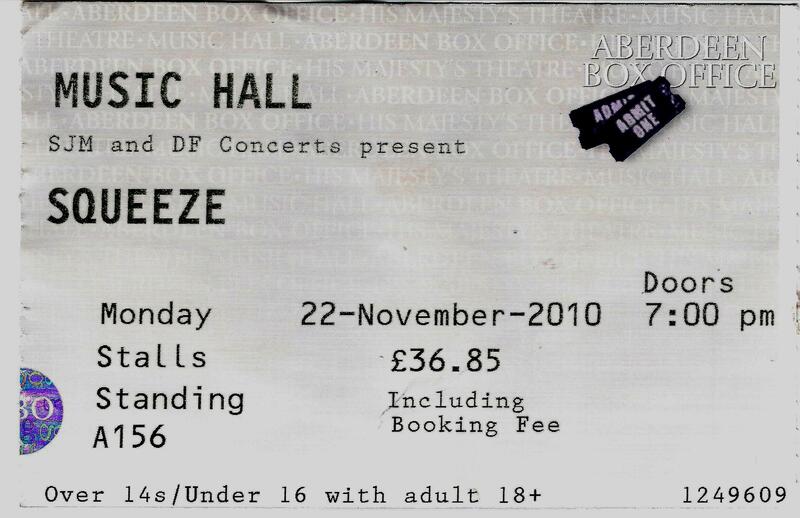 6 Responses to "Squeeze – 22 Nov 2010 – Aberdeen Music Hall"
One of the most enjoyable concert’s I’ve seen in ages! Excellent band, brilliant songs and Glenn Tillbrook, what can I say! SUPERB. and you got Ian Broudie & co. as the warm up! Cheers. another great gig lads!!! come back? merrry go- merry go merry go round!!!! Have to agree with that it was an amazing night in Aberdeen They were all on top form and it was a very great privilege to get to see Chris Difford absent from several of my Squeeze shows looking and sounding amazing even if he dose ware glasses these days. And Glenn as ever was in amazing voice and played some magnificent guitar. They put many of today’s young bands to shame with the amount of sheer talent and energy from a band of mostly over 50’s. I’m still buzzing today it was that good. Lets hope it’s not long before they bring out a new CD as the evidence is they are on fire just now. Long live Squeeze. I was at that show it was wonderful.